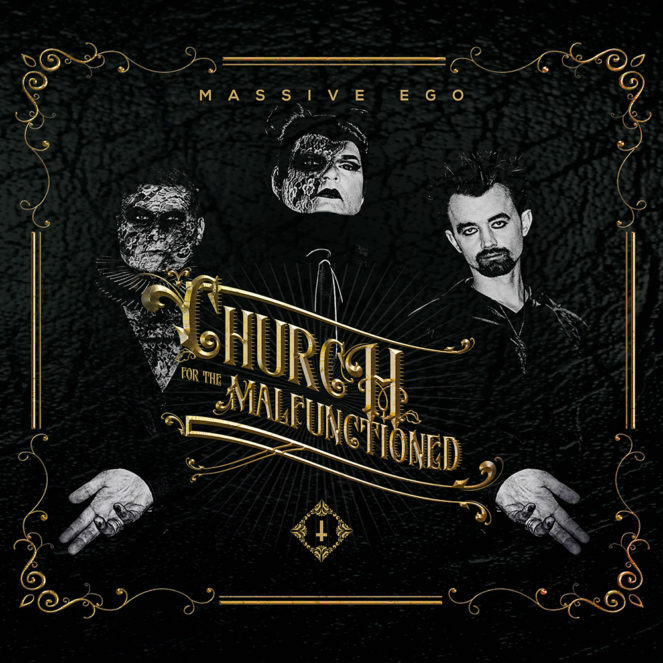 Massive Ego return with their new album, „Church For The Malfunctioned“ a much harder beast than what has gone before, built on beats the like of which we’ve not heard from this band. With songs challenging the very core of religious beliefs and questioning it’s role in todays society.Built on solid 80s electro pop foundations, „Church For The Malfunctioned“ combines Industrial elements alongside gothic tones and euphoric highs. The result is harder, louder and more angry than ever before, whilst remaining barefaced catchy at the same time. “Where the first album was a tentative toe dipped into the dark scene, this album sees us plunging in head first and swimming” vocalist Marc Massive comments, “Because we wear black, smudged eyeliner and listen to dark bands we are often viewed as ‘malfunctioned’ or weird in the eyes of mainstream society, so why not join a new church, a new religion, that want’s to celebrate this lifestyle rather than preying to fake Gods“. „Church For The Malfunctioned“ comes as limited edition 2 CD Digipack with exclusive remix CD, and as a CD/T-shirt bundle. 12. Is The Universe Trying To Tell Me Something?